It’s an odd thing, to recommend a television show that’s best viewed on your phone—but hey, if you don’t like it, blame Steven Soderbergh. 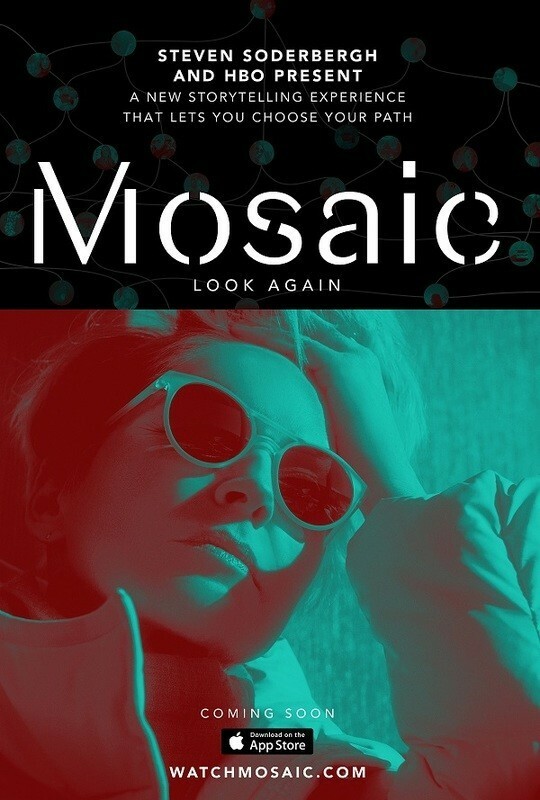 With “Mosaic”, the new six-part series he concocted with writer Ed Solomon, the director has created a riddle, wrapped in a mystery, inside an app. It’s odd, all right, but recommend it I will, and earnestly. As viewed in the six parts HBO began airing on January 22, it’s a solid slow-burn whodunnit. As viewed in the Mosaic app (now also available in your web browser), it’s still a slow-burn, still a whodunnit, but it’s also something new. It’s a story that allows you to select your perspective, to choose which point-of-view will shape your own internal investigation. It gives you the gift of biases that you then choose to have yanked away. That’s an experience that HBO’s series can’t exactly replicate, but it sometimes comes close. Almost all the elements remain the same. Olivia Lake (Sharon Stone), a renowned but one-hit-wonder author and illustrator of children’s books, meets a handsome stranger (Frederick Weller) and falls in love. He convinces her to expand her charity, Mosaic, and change her life. Earlier, Olivia Lake meets a handsome artist (Garrett Hedlund) and takes him in like a stray. His girlfriend (Maya Kazan) doesn’t care for it. Even earlier, Olivia’s longtime friend and surrogate son (James Ransone) tries to get her to sell her land, and she turns him down. Then Olivia Lake gets murdered. The characters mentioned above are just a few of the key players (and potential killers or conspirators) in Summit, Utah; this being a Soderbergh outfit, almost no one’s undefined. All of the performances above are solid, Hedlund’s in particular, but the best and most compelling characters come into focus after the deed is done. Solomon occasionally lays it on a little thick, but for the most part, these are complicated people brought to life with nuance and empathy. It’s never, ever sentimental—the familiar Soderbergh sharpness is found throughout—but director, writer, and performers all leave room for the little streaks of meanness, insecurity, fear, and compassion to emerge. Even the most collected and sympathetic among them are kind of a mess, and it’s terrific. Chief among them: Devin Ratray’s Nate Henry, a local cop who finds himself battling everything from prosecutorial and political pressure to the obligations of friendship. Solomon writes Henry as a man who wields his friendly, unassuming nature as his most useful tool. Sometimes he uses it to set frightened people at ease, while at others it’s just a means of keeping people talking. But that affability has a downside, and when Ratray digs into the small, hurt places that live inside a guy who’s constantly pushed around, Henry becomes a character as complex and finely drawn as any on television. There are other highlights: Jennifer Ferrin’s Petra, the sister of the man first convicted of the murder, and Beau Bridges’ Police Chief Allan Pape are both standouts, but even the smallest characters have at least a little something going on. Much of the texture comes courtesy of Soderbergh’s composition. The camera often seems as though it’s tucked just in front and slightly below a character’s face (as though from a phone, you might say), and the result is both intimate and invasive. We see the ease with which some people lie, and the difficulty it presents to others. Every tell registers. The lack of tells pop even more—as the cool force behind one character’s personal chaos, Michael Cerveris (“Fringe”) is particularly good at this. Even when the camera isn’t perched a hand’s-length away, it seems to hover, hiding around a corner or peering up from hip-level. It’s a compelling perspective on a larger screen, but it’s perfect on those that fit in a pocket. That’s the trouble, if you can call it that, with “Mosaic.” What makes the story really sing, what elevates it above other town-torn-apart-by-murder mysteries, is the interactive element. Soderbergh’s HBO element is still solidly entertaining, but some of the surprises simply aren’t as surprising, because you know someone else has decided the order in which you should experience these stories. You don’t make up your mind based on your own choices, then confront those choices as new evidence emerges. You see Soderbergh’s choices, and Solomon’s. It’s a good yarn, but it’s not the new, groundbreaking thing that “Mosaic” is when experienced in the app. That’s a hell of a good problem to have. At worst, this is a familiar, “Broadchurch”-esque experience, complete with great performances and writing as precise as a whip. At its best, however, it’s a new way to experience a familiar story, and so when the answers you expect arrive, they’re somehow new, too. The predictable becomes unpredictable, the familiar foreign. It’s quite a thing, and no matter how you experience it, it’s well worth the time and, perhaps, the space on your phone.